Florida governor Jeb Bush bills himself as a tech-savvy politician, but he just made a major email etiquette mistake: Bush has published over 250,000 emails people sent to him as governor, easily searchable by date— and he hasn't redacted email addresses or the content of messages, meaning anyone who reached out to the governor now has their messages completely out in the open. It takes seconds to find emails complaining about the Florida voting system following the fraught 2000 presidential election results to New Year's greetings from 2005. "In the spirit of transparency, I am posting the emails of my governorship here. Some are funny; some are serious; some I wrote in frustration. 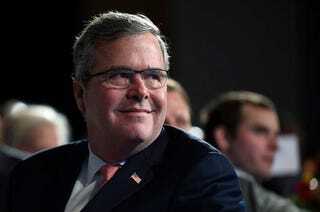 But they're all here so you can read them and make up your own mind," Bush's site reads. Not mentioned: Whether Bush considered how the people who wrote to him felt about using their correspondences in a bid to appear transparent. In many of the messages, people left their full names and personal information, and their email addresses are plainly available. While some of these emails are from other political players, many are from ordinary Floridians who wrote to the governor with the intention of communicating with their elected official through email, not through a published public correspondence. And please do not make this email public to anybody. I do not want my privacy violated, especially by the media. "I am fine with it on the emails concerning homeowners insurance," the woman added. Ones about "illegal immigrants," however, embarrassed her. "My feelings have changed on that subject and I wold hate to unduly upset anyone," she said. Bush clearly does not get the internet like he says he does. This decision highlights a lack of understanding about reasonable expectations of privacy online. Yes, these people were emailing a public figure. By law, he can share what they wrote. But they did not expect these emails to be released in such a public way. And while there's no law forbidding politicians from publishing their emails, it would've been easy to redact email addresses and full names and still keep the intention behind the project intact. This is a tone-deaf move. But it's too late for take-backs: Even if Bush recognizes that this is a breach in trust, the emails are available to download in their original Outlook format, so he won't be able to take back all of the personal information he just released about his constituents. Update: The Verge discovered that some of these emails contain social security numbers of the people who sent them. While it is true that the people who sent Jeb Bush their SSNs should have exercised caution and learned about Florida's stance on the emails of public figures before sharing their personal information, it is still a striking judgment lapse to publish this personal information voluntarily, in a high-profile forum.